Record steps once, and replay as often as you need, anywhere in the world. There’s no quicker way to provision DEP and non-DEP iPhones and iPads. By leveraging backups, GroundControl can configure far more settings than by using your MDM alone. And since our cloud is constantly monitoring operations, you can be assured of consistent, reliable performance for each and every device. Prepare your iOS devices in bulk, straight from the box, with literally zero taps. GroundControl will skip all setup screens; enroll in your MDM, update, and personalize multiple devices at once. Reduce 100 steps to 1 step. Easily create workflows once, and deploy anywhere in the world. Our Workflow Editor requires no coding and minimal expertise. Trigger anything — from iOS updates to full erase and re-provisioning — to run manually or automatically. When deployments are very similar, but not identical, custom attributes allow you to create placeholders in your workflows for campus, building, timezone, group and user. This keeps workflows simple and scalable. There are no limits to the number of devices, users, administrators or workflows with GroundControl. Manage hundreds of locations and deploy in parallel anywhere around the globe. GroundControl works where your devices work, with our patented Launchpad app for Windows PC and Mac. At nursing stations, retail stores and airports, you can’t always expect technical staff to be available. GroundControl gives your IT staff remote, extended reach into every location, for device repairs, resets and updates. Our automation rules and workflows can be configured to trigger actions whenever devices are charging — the perfect time for an OS update or refresh. Launchpad is our patented app for Windows PC and Mac that drives the IT-free operation of devices in the field. Running on a headless PC and a USB hub or dock, IT administrators can automate workflows that manage devices where people work. 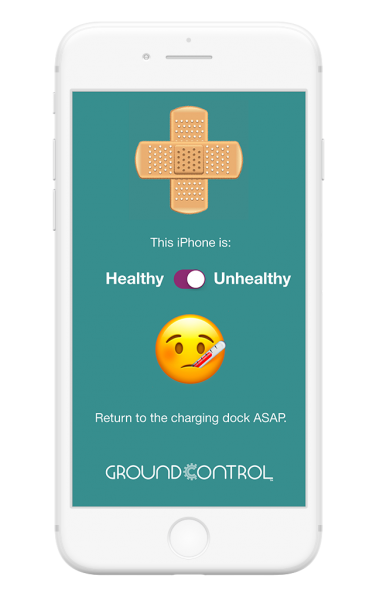 With GroundControl, you control Apple’s iOS updates; the updates don’t control you. Upgrade rapidly, gradually, or not at all. You can even downgrade devices during a limited window. Upgrades occur quickly while charging, so staff won’t be interrupted mid-shift. GroundControl now enables the time-tested technique of “wipe and re-image” for your iPhones. 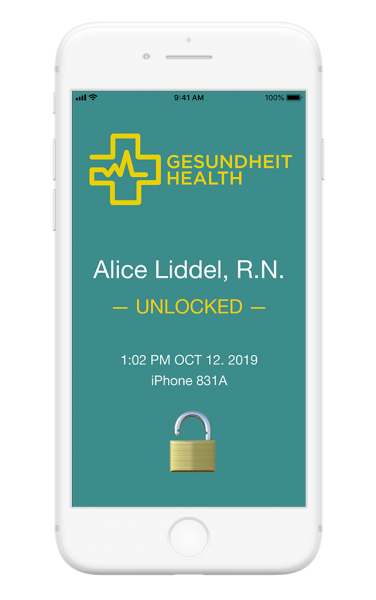 Your staff can flag an iPhone as “Unhealthy,” and the device is reset as new, in less than 5 minutes, without bothering busy IT staff. GroundControl works with numerous third-party USB hubs, docks and locking cabinets to smartly flash LEDs, integrate proximity badge readers, and unlock physical security enclosures when paired with GroundControl. Are you still using sign-out sheets to check out shared devices? GroundControl software delivers true lifecycle management, end-user accountability and enhanced security for shared iPhones and iPads. Tap & Go enables user authentication and asset management; nearly impossible, until now. Keep tabs on who is taking which device, and lock-down devices when not in use. With GroundControl you can now track check-in and check-out: who, when, where and which devices — all from your Device Dashboard. Export full inventory or deployment activity logs at any time, or integrate with our APIs to keep an accurate history of device activity and real-time insights into your fleet. Enforce a personal passcode for each shared device, embed employee name on the wallpaper, and centrally track each assignment, even if they use a different device every day. If an employee accidentally brings an iPhone home, IT can easily determine the last known user and location. When paired with VMware Workspace ONE, GroundControl enables certificate-based, password-free authentication with compatible apps, using SAML 2.0 and OAuth standards. At the end of each shift, we trigger on-device actions to sync data and log out of your apps. We are at the forefront of establishing these emerging industry standards. Let us know if you’d like to help! 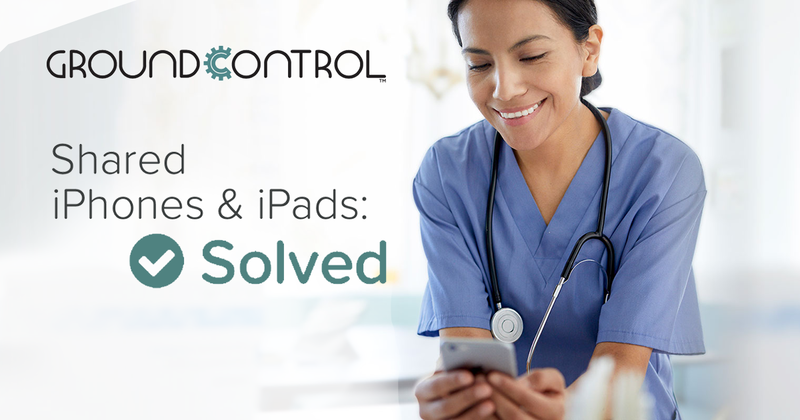 GroundControl customers report more reliable devices, with less IT oversight, and a significant reduction in lost or stolen iPads and iPhones. This translates to immediate ROI for your company and a win-win-win for staff, IT and customers. Tap & Go is our breakthrough system to assign iOS devices to users, with speed and security. We scan your existing proximity-enabled ID badges to authorize check-out. Our system unlocks and assigns the healthiest, fully-charged device within seconds. With proper infrastructure, GroundControl enables Single Sign-On to your critical apps. Check-in is equally simple – just return device at the end of your shift and we automatically log out of compatible apps. Always know who has each device, where and when it was deployed. Device acting up? Fix it and don’t trouble IT. Self Heal is self-service. Simply tap the Heal Me! button and GroundControl takes over, re-provisioning the device as new on your next connection to the charging station. With Self Heal your institution requires less staff and fewer spare iPhones. Instant ROI. To schedule a demo, set-up an evaluation license, or speak to a sales rep, kindly fill out the form below. What is your current MDM?